English caricaturist, whose pre-eminence in social satire matched that of Gillray in political satire. He began as a painter, mainly of portraits, but he turned to caricature to supplement his income (he was a notorious gambler), and finding his sideline highly successful he gave his career over to it completely. His talent for exuberant and flowing line had affinities with the French Rococo of Fragonard (Rowlandson had studied in France), but his rollicking humour and delicate tonal effects were distinctively English; the marvel of his art is that there is no inconsistency between the bawdiness or boisterousness of the subject-matter and the beauty of his watercolour technique. He created an instantly recognizable gallery of social types, such as the old maid, the hackwriter and the crabbed antiquarian, and his buxom wenches have their descendants in the fat ladies of today s saucy seaside postcards. His repertory of themes was inexhaustible and his oevre has been termed the English equivalent of Balzac s Comdie humaine. He was a friend of George Morland and travelled about England and also in France, Germany, and the Low Countries making rapid and brilliantly illuminating sketches of country life. In addition he produced series of illustrative drawings for publishers, notably The Comforts of Bath (1798) and the series on The Tours of Dr Syntax (1812-20). 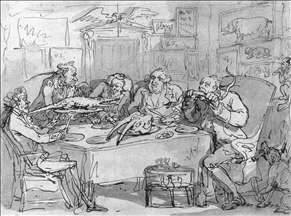 Rowlandson s output was huge, but it was only towards the end of his career that the quality of his work suffered because of overproduction. Although he is commonly thought of as a satirist, most of his drawings are gently humorous, and in some cases objective, records of urban and rustic life. With the exception of a small number of topographical drawings, they are characterized by an abundance of picaresque incidents, whether robust or sentimental, and have much in common with the novels of Laurence Sterne and Henry Fielding, which Rowlandson illustrated in 1808 and 1809. See more details about "The Fish Dinner"